The Soo Theatre Project presents a STARS Candlelight Christmas, Saturday, December 16 at 7:30 p.m. at St. Mary's Church, 320 E. Portage Ave, Sault Ste. Marie, Michigan. 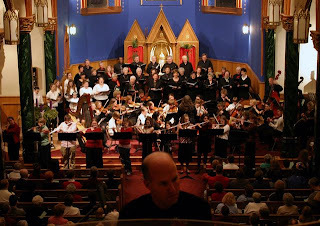 Featured will be Singers United, the Youth Orchestra, the Youth Chorus, the Cello Choir, the Flute Choir and Flute Club, the Recorder Consort, and the “Not Quite Ready for Prime Time” Players (adult string ensemble). Suggested donation: adults $5, children $3, family $12. Music! Dance! Theatre! Visual Arts! Yoga! Registration for Winter/Spring 2007 classes at STARS begins Monday, December 4. A class schedule is available online or stop in and pick one up. A STARS Student Information form (PDF only) is also available online. Register in person weekdays 10-6. Your registration and payment ensure your place in class.